I checked out the blog of a new visitor of mine today, Vanessa at Design Dreams Japan and saw that she painted her walls with bold stripes.... a feat I admire! I first read about this DIY tutorial about 2 years ago at Young House Love. 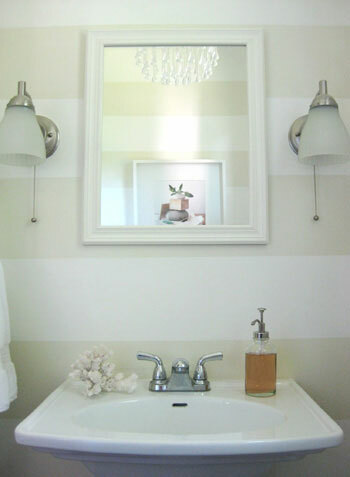 I went out and bought the frog tape, already had the paint, but still have not attempted the striped walls look. 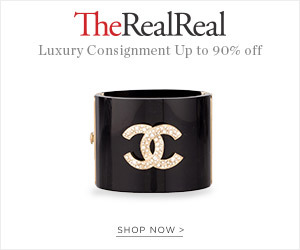 They look great and I think it would look great in one of my bathrooms in neutral colors. 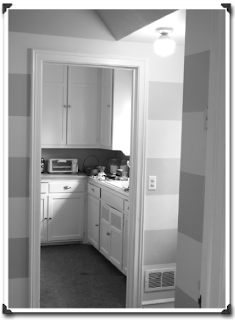 Have you tried striping your walls yet? What 2 colors would you or did you choose? Vanessa's striped walls from Design Dreams Japan. I love them in a broad horizontal band, like in the bathroom or in a hallway like you show here - such a cool, bold statement! Thanks for showing my stripes! I must be subconsciously influenced by YHL. btw I have 4 of these pictures in my Pinterest Stripes file!